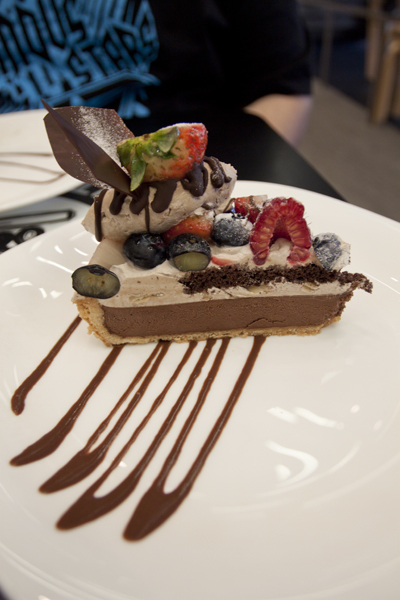 I finally tried the tarts at Fruit*Paradise over the weekend! I am always a little wary about desserts that look too pretty because they are potentially a huge letdown if they don’t taste as good as you would imagine it to be. We went for the $9.80 set which allowed us to choose any tart on the shelf along with a hot or cold drink. The mixed berry chocolate tart and banana chocolate tart were great with the generous portions of fruits and cream, but the mango tart was the best. We unanimously agreed that it was the only tart that we wouldn’t mind having a second piece because the taste was deliciously light with the cream, mango and yummy crust. With that said, all of them taste too sinful to enjoy often. Too much cream & sugar involved! This entry was posted in Food and tagged dessert, food, fruit, photography, pretty, tart, yummy by lifestartsonfriday. Bookmark the permalink.